While I've kept plot details for the third season to a minimum, please be aware that there are some major spoilers for the show's first two seasons. In Westeros, the balance of power is in an ever swaying state of uncertainty, tied to a swinging pendulum so fragile and fickle in construction that it could simply give way and collapse at any moment. In Westeros, the dead walk again, dragons take to the skies, and men become monsters while monsters become men. In Westeros, the corrupt rise to prominence and love leads to beheadings. In Westeros… honor bleeds. This is the setting for HBO's 'Game of Thrones,' and through the land's tale of war, betrayal, and sacrifice, the series continues to reach new heights -- thrilling, delighting, devastating, and frustrating audiences in equal measure, becoming the very definition of appointment television. Picking up in the aftermath of season two's fiery climax, season three focuses on the medieval continent of Westeros during a brief state of respite from an ongoing war for the crown. The sadistic boy-king, Joffrey (Jack Gleeson), remains on the Iron Throne while his nefarious grandfather, Tywin Lannister (Charles Dance), reasserts his power as the country's clandestine ruler. Meanwhile, the noble Robb Stark (Richard Madden) makes traction in his rebellion, hoping to avenge his father's death and thwart the Lannisters once and for all. Likewise, across the sea, Daenerys Targaryen attempts to amass an army, planning to finally reach Westeros with her growing dragons in order to reclaim her family's kingdom. But as more players are defeated and shuffled around the board, an ancient, deadly threat reemerges, potentially spelling doom for the entire realm. Based on roughly the first half of George R.R. Martin's 'A Storm of Swords,' the narrative once again finds our massive cast of characters scattered about the map, with many different intersecting plotlines slowly escalating and evolving. And though the story still lacks the kind of cohesive through-line that made season one's plotting so tight and satisfying, the fractured scripting here feels a little more balanced than season two's slightly meandering structure. As the epic tale continues to progress, we start to get a greater sense for the narrative's broader scope, and it becomes increasingly clear that every development is building toward something much larger, with shades of the show's potential endgame coming more and more into focus. This is in an intricately plotted series, and every season is simply a small part of a massive story; a long game of chess full of slow, calculated moves and reversals, and the writers and producers are getting an even better feel for this type of deliberately paced storytelling. Compared to many other series, the amount of forward progression here might seem a bit lacking, but D.B. Weiss and David Benioff fill each small bit of strategy and development with so much texture and nuance that the rhythm never feels stagnant. And thankfully, despite this sometimes slow tempo, the season is still full of intriguing twists and status quo shattering set pieces that promise to shake up the show in irrevocably shocking ways. Many new characters are introduced, old ones are sidelined, and unlikely pairings are made, continually shifting the series' focus as different plot threads take natural prominence over others -- and all the while, members of the core ensemble still get key moments to take the spotlight. Though her character's arc was mostly underwhelming last year, Daenerys' story finds new momentum in season three, and Emilia Clarke shines brightly as the progressively strong willed "Mother of Dragons." Her nearly messianic quest to free slaves and build her forces proves to be one of the season's highlights, and it's hard to believe that this intimating and inspiring leader was once the meek, submissive woman that we met in the show's pilot. Hell, this season the character reaches genuine "badass" status. Don't believe me? One word: "dracarys!" Other plotlines see new character pairings that prove to be surprisingly engaging as well, including unexpected circumstances that join Tyrion and Sansa, and Arya and the Hound. That latter pairing is particularly interesting, and much like in previous seasons, the show continues to reveal new layers to already established characters -- further blurring the line between hero and villain. Jaime's storyline is perhaps the most representative of this phenomenon, and Nikolaj Coster-Waldau turns in an amazing performance, shedding an entirely new light on the infamous "Kingslayer." His gradual path toward possible redemption is by far one of the show's most fascinating and effective arcs (and this is a show full of engaging arcs), and one specific scene where the battered man recounts his actions during the Sack of King's Landing is simply mesmerizing. Every character is full of such incredible depth, that many quiet, confessional sequences like this end up being more memorable and affecting that any battle scene could ever hope to be. Indeed, as deep as its blades pierce, in the world of 'Game of Thrones,' sometimes words prove to be even more devastating. Dialogue crackles with quotable insights and pulses with lyrical musings, and a crass undercurrent of witty humor perfectly tempers all the gravitas. The clever wordplay is both entertaining and disarming, and many of the show's dueling conversations sting with emotional resonance. In fact, a particular exchange between Tyrion and Tywin early on in the season easily ranks as one of the most brutal sequences the show has ever seen -- and not a single drop of blood is shed. Of course, plenty of actual blood is eventually spilt throughout these ten episodes, and much like in season one and two, episode nine proves to be the year's most powerful. 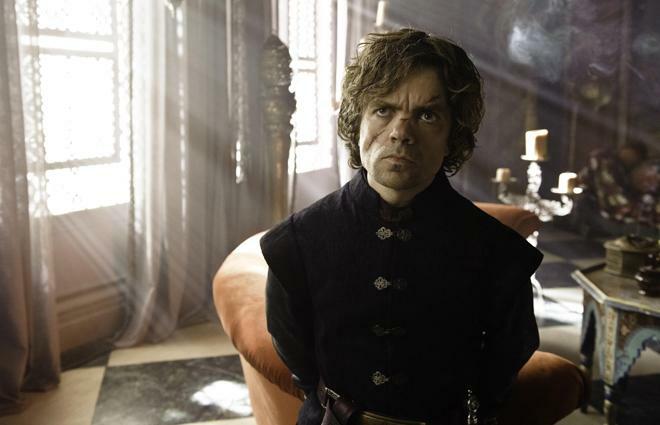 Actually, come to think of it, when all is said and done, "The Rains of Castamere" may be remembered as the show's most infamous and gut-wrenching installment. 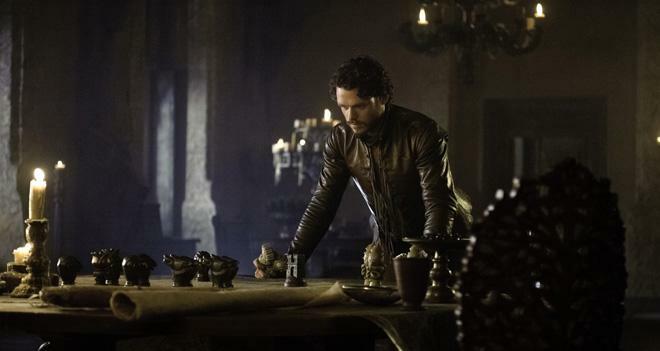 So much has already been made about the "Red Wedding" that I'll try to make this as brief and vague as possible. There is one key moment during the build-up toward the climax that is absolutely perfect. A door shuts and a familiar melody plays on from above; a weeping cello tune full of foreboding. The mood immediately changes, and one character's expression turns to fear and apprehension. They know something is amiss and there is no going back… and once the screen mercifully fades to black, the same could be said for the show itself. As enraptured as I am by the series, season three still isn't quite "perfect." Bran's storyline feels a bit undercooked, Theon's unsettling arc is a little extraneous, and though the finale is relatively satisfying, there is still a nagging feeling that we have only finished half of a book in an even larger ongoing tale. With that said, as far as TV goes, 'Game of Thrones' continues to be a nearly peerless example of storytelling art and a monumental feat of small screen production design, and if this season is any indication, the show seems to be only improving as it continues to develop its rich, exciting, magical, and utterly heartbreaking world. And as overwhelming as this year's revelations have been, one gets a sense that even more triumphs and losses are lurking just around the corner. "Yes now the rains weep o'er his hall, and not a soul to hear." 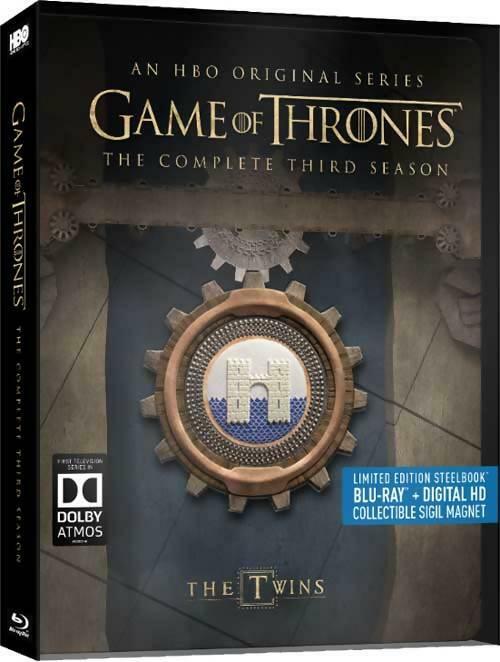 HBO presents 'Game of Thrones: The Complete Third Season' in a new limited edition Steelbook package. Five BD-50 discs are stacked (three on the left side, two on the right side) in a sturdy Steelbook case that comes housed inside a plastic shell. A plastic tray is also included that features a magnet of the Twins. Instructions for an UltraViolet/iTunes digital copy are included as well. After some warnings, logos and skippable trailers, the discs transition to standard menus. The packaging indicates the release is region A compatible. The show is provided with a series of 1080p/AVC MPEG-4 transfers in the 1.78:1 aspect ratio. Viewers of 'Game of Thrones' know exactly what to expect here, and thankfully HBO does not disappoint. One of the most beautiful shows on television once again receives one of the most impressive video presentations that the small screen has to offer. Clarity is absolutely exceptional throughout the season, offering an impeccable sense of texture and fine detail that brings all of the series' varied locations, intricate costumes, and staggering sets to life. The production design is really second to none when it comes to television, and the work done here easily rivals many feature length Hollywood efforts. Depth is also breathtaking, giving Westeros a life-like level of dimension. Color temperatures vary depending on the location, washing the screen in cold, icy blues and whites north of the wall, warm reds and yellows in the deserts across the sea, and lush greens in the beautiful gardens of King's Landing. Ranging from appropriately dreary to gorgeously sumptuous, the colors pop from the screen and always suit the content perfectly. Contrast is also wonderfully balanced, with bright whites that don't bloom and very solid blacks with strong shadow delineation. With that said, however, black levels do have a tendency to veer a bit toward blue in several dark and nighttime scenes. And as undeniably impressive as the entire video presentation is, unfortunately the transfer is not without some very minor encoding issues. The digital source is mostly clean and pristine, but there are fleeting, isolated instances when banding, noise, and faint signs of compression are visible. These artifacts usually pop up during transitions or darker sequences, and while very minimal, brief, and rare, they can be noticeable when they do occur. Though there are some very small technical issues here and there, this set remains one of the most visually stunning releases available on the Blu-ray medium. I found the brief encoding issues to be slightly more noticeable than on previous seasons, so I've marked down the video score just a bit, but fans should know that there really is very little to complain about here. For all intents and purposes, this is another stellar, demo worthy video presentation for the show. Since I've already covered the basics of the audio in my original review (for all intents and purposes the same strengths apply here), I'm going to focus exclusively on the Atmos-specific benefits of the new mix in this review. Taking the series' already intricately layered sound design to the next level, the inclusion of height objects creates an even more enveloping experience, especially during key sequences. To be clear, the upgrade doesn't always lead to a night and day difference and many of the additions are appropriately subtle -- but the mixers have done a great job of employing height effects when called for. In most cases, this means expanding upon the show's general ambiance and score, sending various atmospherics and music cues to your ceiling or upfiring speakers. Dancing flames, distant bells, gentle winds, crashing waves, and chirping birds all seamlessly pour from above, enhancing each location with an extra plane of sound. The scene where Jon blows his cover with the Wildlings while Bran wargs into Hodor is especially enveloping, as rain and thunder bellow from the heights. Likewise, a romantic dalliance between Jon and Ygritte in a cave is also noteworthy, as we can hear water drip from the ceiling and a flowing waterfall descend from above. In addition, the infamous Red Wedding is made even more excruciating in Dolby Atmos, but mostly through some harrowing overhead music cues. The end of episode four is also a major highlight with perhaps one of the season's best (and most kickass) uses of Atmos. As a slaver holds one of Dany's dragons overhead with a chain we hear the creature screech and flapping from above, and then when the would-be queen utters "Dracarys" the beast lays waste to his captor with explosive fire raining from the sky. Being the OCD reviewer that I am, I even skimmed through an episode using just the Atmos-enabled modules to get a full sense for just how active they are. And though certain indoor dialogue centric scenes are understandably devoid of height effects, the upfiring speakers engage nicely whenever it makes sense for them to do so. Improving upon the previous 5-star audio mix in both subtle and more aggressive ways, this Atmos mix is a great example of how height objects can organically enhance a soundtrack. Audiences might not be able to pinpoint sounds coming from above in every scene, but the seamless design philosophy here always naturally serves the content on screen without resorting to gimmicks. With a mixture of subtle and more aggressive Atmos height cues, 'Game of Thrones' continues to be a versatile and impressive example of the audio tech. Likewise, it should also be noted that the Atmos tracks will play as Dolby TrueHD 7.1 for users who don't have Atmos systems. This means that 7.1 users will still get an upgrade over the 5.1 tracks found on the previous release, even if they don't have Atmos yet. Audio Commentaries - Commentary is provided on episode two with writer Vanessa Taylor, director Daniel Minahan, actress Natalie Dormer, and actor Jack Gleeson. The participants share details about the locations, changes from the books, and go on various tangents related to actors accidently shooting down lights and Jack Gleeson's impressive "guns." Overall, this is a fun, easygoing bunch that offers a worthwhile and entertaining discussion of the show, setting the stage for the rest of the amusing and informative commentaries to follow. A Gathering Storm (HD, 14 min) - Presented with DTS 2.0 sound, this is an overview of the second season with cast and crew interviews offering insights on the characters and major plot points. New Characters (HD, 10 min) - Presented with DTS 2.0 sound, this is an overview of the third season's many new characters with cast and crew interviews elaborating on all the new additions. Audio Commentaries - Disc Two includes three more commentaries: Two for episode three, and one for episode four. Executive producers David Benioff & D.B. Weiss provide commentary on the first track for the second episode, and production designer Gemma Jackson and costume designer Michele Clapton provide the additional track. The producing duo share several tidbits about handling directing duties for the first time and spend a good amount of the track complimenting the talented cast. Meanwhile Jackson and Clapton focus on their work and approach toward the show's amazing sets, costumes, and overall design work. Finally, actresses Lena Heady and Diana Rigg, and director Alex Graves speak over episode four. The trio offer more production anecdotes and fun insights. Audio Commentaries - Actors Nikolaj Coster-Waldau, actress Gwendoline Christie, and writer Bryan Cogman provide commentary on episode five. The trio provides some obligatory gushing over the opening titles and then shares some fun tidbits related to fire swords, Jaime's progression, and Robb's kingly cleavage. Episode six features two commentaries: one from Kit Harington, Rose Leslie and director Alik Sakharov; and one from Sophie Turner, Maisie Williams, and Isaac Hempstead Wright. The first track features details about the shooting schedule and trivia about accomplishing individual scenes. Meanwhile, the second track starts off with the adorable Stark children continuing their tradition of singing over the theme song -- this time with a "mature" percussion interpretation that quickly devolves into silly giggling. Finally, author George R. R. Martin and director Michelle MacLaren offer commentary on episode seven, providing more interesting details about scripting, production, changes from the book, and working with bears. Audio Commentaries - Episode eight features commentary by actor John Bradley, actress Hannah Murray, and director Michelle MacLaren. The group spends time sharing worthwhile production trivia, including bits about rehearsals, locations, and leeches. Episode nine features two commentaries: one from Richard Madden, Michelle Fairley and director David Nutter; and one from weapons master Tommy Dunne, stunt coordinator Paul Herbert, asst. stunt coordinator David Forman, and swordmaster C.C. Smiff. The former actually gets rather emotional during the Red Wedding scene as this is actually the first time Fairley has watched the episode, and she and Madden both break down during the climax. The latter focuses on the show's use of weapons and stunts. 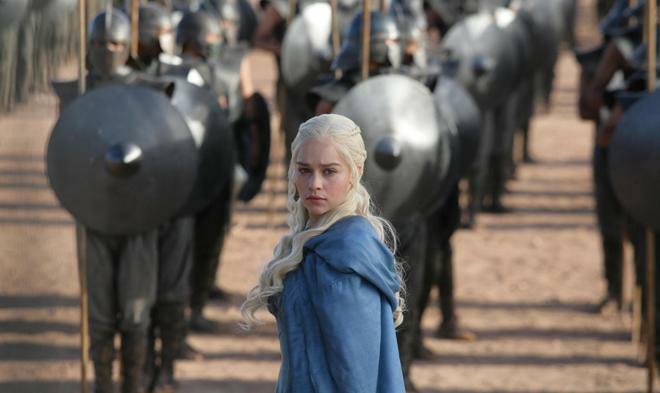 Audio Commentaries - Episode ten features commentary by Emilia Clarke, Iain Glen, and Iwan Rheon. The trio shares some solid insights and anecdotes while also getting lost in show from time to time (who can blame them?). Inside the Wildings (HD, 6 min) - Here we get a featurette focused on the Wildings with cast and crew interviews elaborating on the characters who live beyond the wall. Deleted/Extended Scenes (HD, 14 min) - Five excised or extended scenes are viewable separately or together in 1080p. These are all worthwhile, but the real highlight here is a great scene between Maester Pycelle and Tywin. 'Game of Thrones: The Complete Third Season' is an example of television storytelling at its absolute best. With peerless production design, fantastic performances, exceptional writing, and incredible direction, the series easily remains one of the best shows on TV. This new Steelbook package offers the same great video and supplements from the last release, and adds a great new Dolby Atmos audio presentation -- improving upon an already exceptional mix. With that said, since there really isn't any new content here, it makes the bottom line recommendation a little tricky. For Atmos users (or those who plan to upgrade) who don't already have the show, this is an absolute must own set. Likewise, depending on how big of an audiophile you fancy yourself, even Atmos users who already own the previous Blu-ray might want to consider upgrading to this release. If, however, you already own the series and don't have (or plan to ever have) Atmos, then this set will really only appeal to diehard Steelbook collectors. But any way you look at it, this is now the best Blu-ray version of one of the best shows on TV.